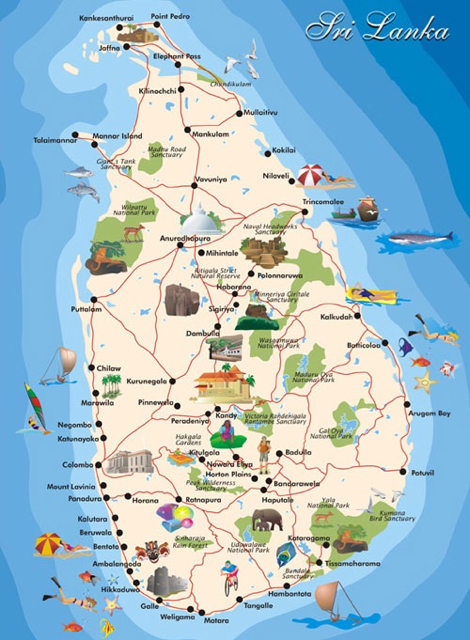 FROM TEMPLES TO TUK-TUKS – SRI LANKA has so much to offer the traveller. With daily delights and surprises in store, we headed off on our adventures. 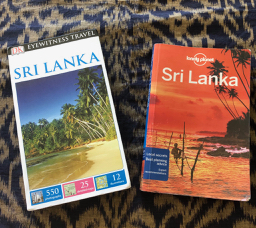 We had booked the trip way back in June last year, but I didn’t open either one of these guide books until we were on the plane to Colombo. The Art of Travel. The ideal – admittedly impossible – is to arrive fully informed yet with no preconceptions. I only have one tip for choosing a new holiday destination and Sri Lanka fitted right in there. ONLY GO TO PLACES THAT HAVE WINE AS PART OF THEIR CULTURE – OR, THEY EAT CURRY. I’m almost embarrassed to admit that what I knew about Sri Lanka could have been written on the back of an envelope. 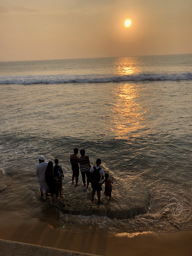 I knew something about the terrible 30 year civil war, the devastating 2004 tsunami when 40,000 people lost their lives, quite a bit about the food and a lot about the cricket – and that was about it. 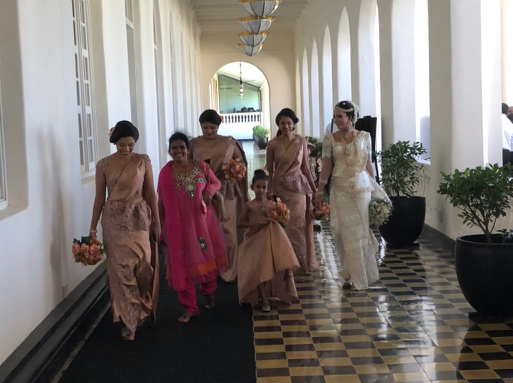 I was racking my brains to think of famous Sri Lankan writers, musicians and artists – in fact any notable people – and all I could come up with were cricketers, writer Michael Ondaatje, and past Prime Minister, Mrs Bandarnaike. 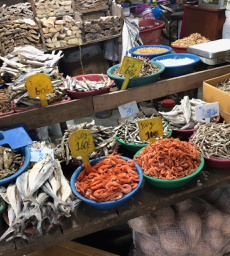 Oh, and I had heard about Australian artist Donald Friend making it his home there at some time – more of that later – and Charmaine Solomon whose cookbooks introduced me to the wonderful world of Sri Lankan cuisine. Discovery 1: Does this name ring a bell? Sirimavo Bandarnaike – she was the FIRST WOMAN TO BE ELECTED HEAD OF ANY GOVERNMENT IN THE WORLD in 1994. She was a socialist and head of the Sri Lankan Freedom Party and her legacy has political, social and cultural influence even today. For starters. 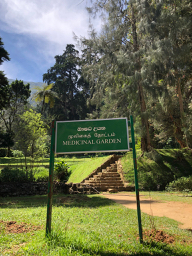 I didn’t know that Sri Lanka is a Democratic Socialist Republic with UNIVERSAL HEALTH CARE from the cradle to the grave and PUBLICLY FUNDED EDUCATION FROM KINDERGARTEN TO UNIVERSITY. They have a 92% literacy rate. We arrived in the early hours of the morning, after five weeks of winter travelling in Europe and a big family Christmas in the UK, so to say that we were pretty exhausted would be a fair call. 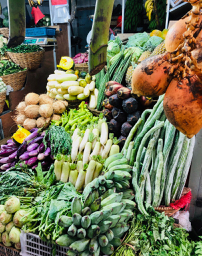 What struck us straight away was the familiar smell of Asia – diesel, drains, spices and tropical flowers – the only thing missing was cigarette smoke – and then it struck us – nobody was smoking. 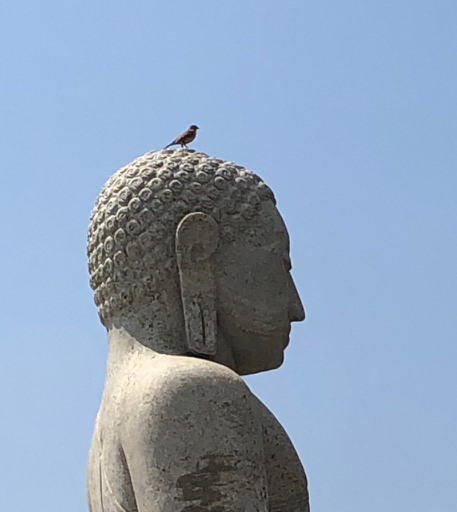 In fact, in the three weeks we were in Sri Lanka I didn’t see anyone smoking – just one single, solitary chap sitting on his front step – no lingering smell in tuk-tuks and taxis, no cigarette advertising. Very strange. How? Why? I thought I had booked a beachside hotel in GALLE – a UNESCO listed old Dutch fort town about three hours down the coast from the airport, so was most surprised when we pulled into the GALLE FACE HOTEL in COLOMBO only thirty minutes from the airport – a very fancy colonial wedding cake of a place – built at the beginning of the road that FACES GALLE (tinkle – that’s the sound of the penny dropping). Stunned, tired and beyond caring we fell into a luxurious bed in a luxurious suite with the sound of the sea crashing onto the beach just a few feet away – leaving the worrying about how much this was actually costing till the morning and how the hell we had ended up in Colombo? The GALLE FACE HOTEL was the start of our “where on earth are we going to end up next” trip to Sri Lanka. 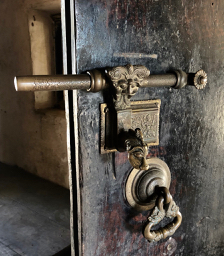 We found ourselves in the most British of post-colonial hotels that required a crash course in Sri Lankan history because it was all quite bizarre – in a charming sort of way. 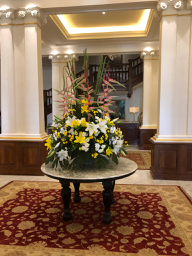 Opened in 1864, it was the hotel of choice for anyone, who was anyone, travelling by ship in the East and found themselves pulling into the port of Colombo – the pearl shaped island of Ceylon hanging off the ear of India. 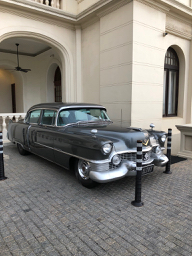 Previous guests included Don Bradman, Cole Porter, Mark Twain and Prince Philip – who stayed there in 1940 when he was a 19 year old Midshipman. His first car is still parked outside (I suppose he couldn’t take it home with him). 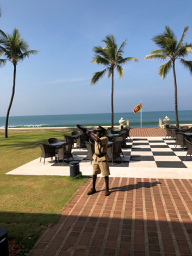 We were entertained at breakfast, which was a fantastic smorgasbord of Sri Lankan and European delights, by the antics of a hotel staff member, replete in khaki Bombay bloomers and armed with a catapult – whose job it was to wander around all day in the garden, taking pot-shots at the pesky crows. I kid you not. Then at 6pm – as I was sitting on the very elegant verandah gazing out to sea, with a gin and tonic in my hand (“will that be a double madam?” – I was beginning to like this place very much) I heard the sound of bagpipes – which always gives me a catch in my throat and tears welling in my eyes. 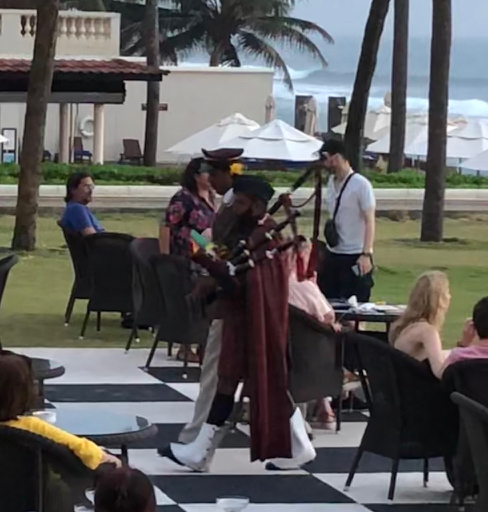 Checking with same kind waiter, I discovered that at sundown every day a kilted soldier arrives from the barracks, with his bagpipes, and walks through the hotel and grounds to pipe down the Sri Lankan flag (would have been the Union Jack in the old days) which flies every day from a flagpole on the beach. I was beginning to feel more and more like I was an extra on a Merchant Ivory film-set. Discovery 2 – the British and Cricket. The British (1815-1948) were the dominating colonial power here when Sri Lanka was Ceylon. With its strategic position in the Indian Ocean along major trading routes between West and East, and it’s close proximity to India, it was a prize to be added to the British Empire – another jewel in the crown which was only relinquished when Independence was gained after WWII. Their legacy is still palpable in modern Sri Lanka with English taught in schools and spoken everywhere (along with Sinhalese and Tamil). The British also built the wonderful railway system and left behind a fanatical love of sport – golf, tennis, badminton, horse racing, polo, and the game they are most passionate about above all – cricket. While we were there there was a test match series between Australia and Sri Lanka and it was all any tuk-tuk driver, porter, shop assistant, waiter, tour guide – in fact everyone wanted to talk about. GALLE FACE GREEN. Lucky us. 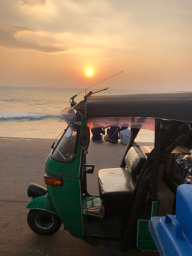 We very quickly discovered that our hotel was right next to the historic hang-out spot for the locals of Colombo – it’s been that way for a couple of hundred years – a few acres of grass fronting onto the beach and crashing ocean, that has seen it all. At the celebration of Queen Victoria’s Jubilee in 1897 an estimated 25,000 people packed the Green along with marching bands, 100 elephants, a 50 gun salute – Empire might and splendour. 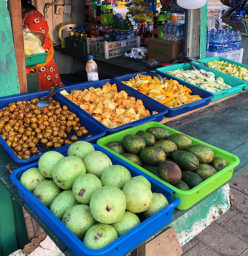 These days, at sunset, it turns into a bustling promenade with Sri Lankan street food at its most delicious. 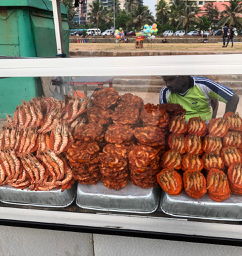 The speciality is isso wade – prawn fritters made from a spiced lentil batter and served with a typical sambal of fresh grated coconut, tomato, chilli and lime (pol sambol). GALLE FACE GREEN A must if you are visiting COLOMBO. Rapidly changing and being dwarfed by new high rise, massive fancy hotels and a port development funded by the Chinese. 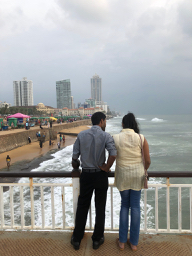 For the couple of unexpected days we spent in Colombo, we had fun taking a tuk-tuk and exploring museums and the rich architecture of its colonial past. A trip to the railway station to buy our tickets to Kandy was an adventure all in itself. 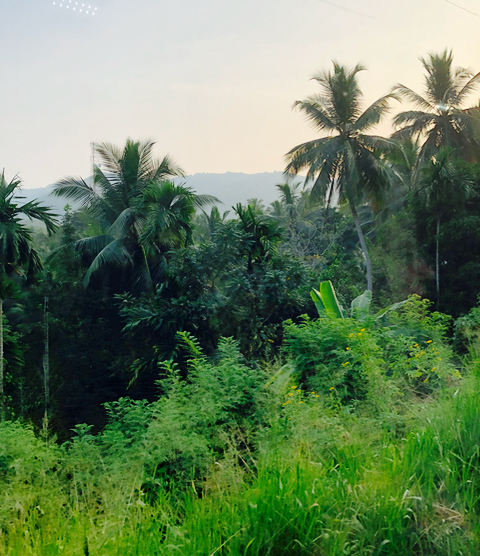 We had been told, by previous travellers to Sri Lanka, that the best way to get from Colombo to Kandy was by train – it’s straight uphill, unlike the road, its relatively quick, unlike the road, it’s not congested, unlike the road AND you won’t be choking all the way from the air pollution, unlike the road. Just make sure you pre-book a seat in first or second class – all very inexpensive – otherwise you may find yourself standing all the way. This trip was like travelling back in the 1950’s, chugging and puffing away through the villages in the backblocks of Colombo and out into the gloriously exotic countryside – past every conceivable religious shrine and temple, wandering cows and dozens of people using the railway line as a shortcut – businessmen in slacks, shirts and dress shoes – school children in smart uniforms, women carrying water and men squatting in striped sarongs chewing and spitting the bright red betel nut. 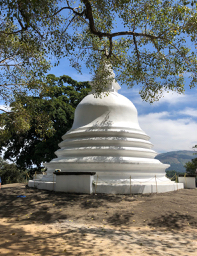 Then up, up, up through the jungle to the Hill Country and the ancient capital of Sri Lanka, Kandy which has the holiest Buddhist shrine in Sri Lanka – Buddha’s Tooth Relic. 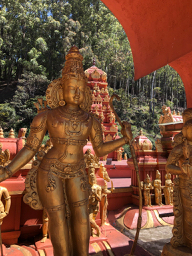 Discovery 3 – Sri Lanka is a fascinating colourful blend of religions that reflects its historical past. 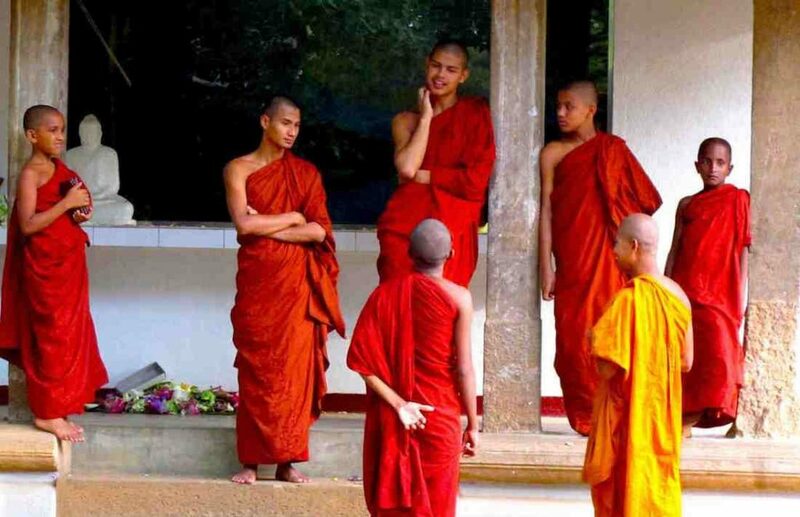 Predominately Buddhist 71%, Hindu 13%, Muslim 9% and Christian 7%. 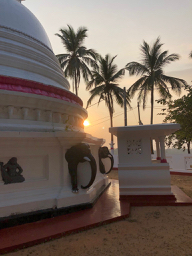 Buddhism is the belief system of the majority Sinhalese and has a huge influence on the country’s art, architecture and literature. 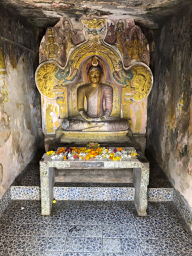 Buddhism and Hinduism arrived centuries BC from India – the Tamil population being mostly Hindu; Islam came with the Arab traders and Christianity was brought by European colonialists – Portugal, Holland and Britain. It is ten years since the end of the twenty-five year long Civil War in which 100,000 people lost their lives – a complex struggle which saw the Tamil minority, mainly from the north, seeking independence. 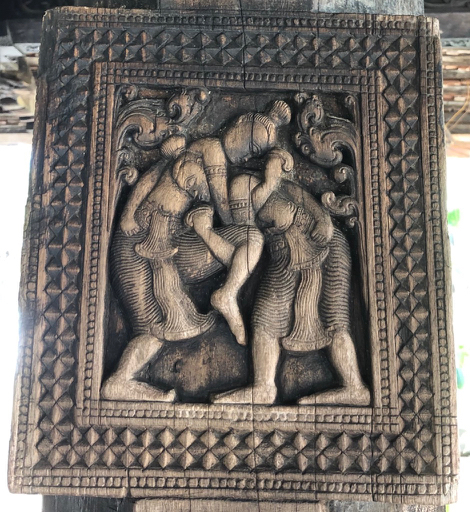 In the decade since, Sri Lankans have rediscovered the relic of ethnic coexistence that was part of their history for centuries. Sri Lanka seemed like a very harmonious place to us. As we were driving in the hills around Kandy our taxi driver, who was Buddhist- you can tell by all the jingle-jangles they have hanging over the dashboard – told us that we were passing a newly built Tamil village and asked us if we would like to stop and have a look at their rather lovely Hindu Temple. We said that if it was appropriate, we would like that very much. We stopped. He spoke to some elderly men who were sitting around out the front, they nodded in approval at whatever he said and we all got out. 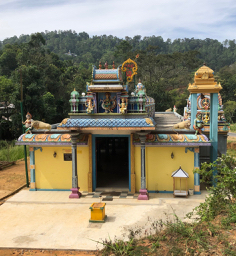 The first thing our driver did was walk a little bit away from us, stand in front of the temple, put his hands in the prayer position and bow his head in respect. This scene happened over and over again as we travelled around, with the faithful blending together and attending to their devotions side by side, as temple stood next to stupa a next to chapel. 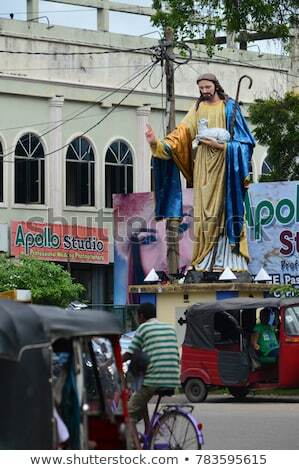 We were told by a tuk-tuk driver in Bentota that there was still some trouble from radical Buddhists (an oxymoron?) against fundamental Islamists and evangelical Christians – a church and mosque were recently torched, but mostly people have put the past behind them and want to get on with their lives in peace. 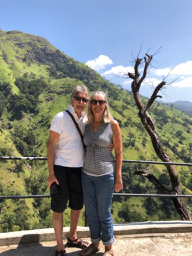 We never did get to see the famous Tooth Relic Temple OR the Botanic Gardens, which sit on the picturesque lake in the centre of Kandy – the main reason why we had come here, because our driver refused to take us! 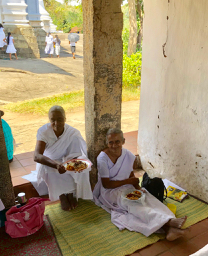 The day we had put aside for sightseeing – (which was a mission in itself, as our hotel was a 45 minute drive to Kandy on the most treacherous road) happened to be a Buddhist public holiday – Duruthu Full Moon Poya – and the place was packed with pilgrims, dressed in white and laden with flowers for offerings. “Much too busy” he said, as he zoomed past and out into the countryside to visit some ancient Hindu Temples. We couldn’t have cared less really because it was all new and equally as fascinating. We were a bit perplexed later on, however, when he suggested lunch and driving back into the centre of the city, pulled into a restaurant right opposite the Botanic Gardens, without any problem at all? I forgave him because it was in said restaurant I had the most delicious soup I have ever eaten – I had three bowfuls (it was a buffet!) 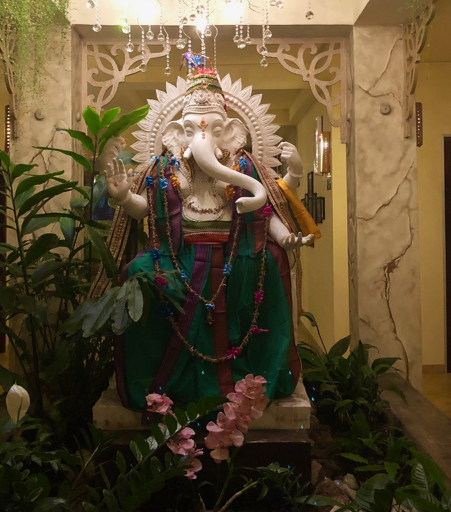 – I was it informed that it was their speciality – ayurvedic vegetable soup – yum. THE GALLA VILLA HOTEL. 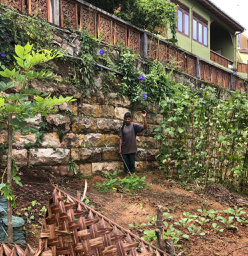 I thought I had booked a bungalow just outside Kandy, but no – you see what I mean about this trip being full of surprises? 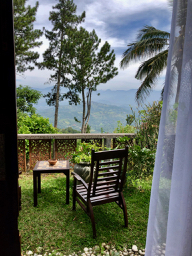 But, we had arrived in heaven, literally, because we were staying in a hotel overlooking the Knuckle Ranges, an hours’ drive from Kandy, way, way up in the hills – I could have stayed there for weeks. What a contrast to Colombo? 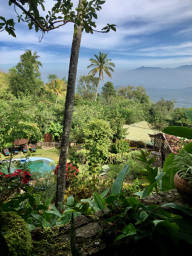 The Galla Villa was a small, rather quirky, pavilion style hotel perched on the side of a hill 1,000 metres up in the clouds, surrounded by a wonderful tropical food garden with outdoor yoga space and lovely pool with spa – ayurvedic massage anyone? Each spacious room had been individually decorated, by the Czech owners (this is where I choose the word ‘quirky’ with confidence – the decor was, well, unique), and had a private garden to take tea and the view. It was so relaxing, we stayed an extra three days. More quirks? We got used to the hot water suddenly going off when you were all soaped up in the shower, and waiting an hour for food when there was no one else in the restaurant – it was worth the wait though and, besides, there was nowhere else to go. We read, swam, ate and slept in the delicious cool of the night which required digging out the pyjamas. 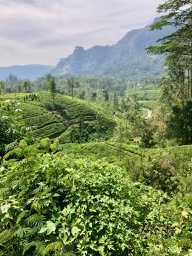 We also went for leisurely strolls, through the surrounding pepper and tea plantations, up to a lake and Buddhist temple – all quite lovely. 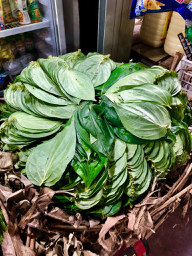 This was born out when I was given a tour of the hotel’s food garden. 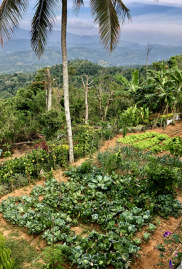 I was told that all the food at the hotel was organic, but I suddenly became alarmed when I saw the gardener with a sprayer on his back. Making enquiries of the delightful Hadeep, head gardening chappie, who also doubled as hotel day manager, (who had taken off his shoes and tie before we went out into the garden), he replied. “Madam, do not worry. You see next to the gardener is the compost heap. 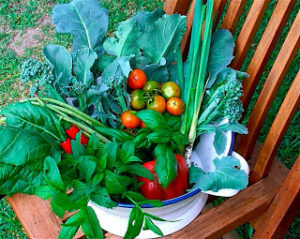 He mixes some of that in a bucket of water then strains it into the container then sprays it onto the plants. 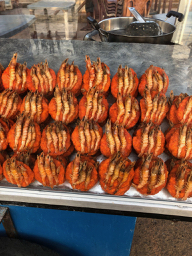 It makes them very strong you know, and good to eat”. COMPOST TEA!! – you can see why I was in heaven. I could also see where Hadeep’s heart lay. He told me his life story and if he were not the eldest son of a widowed mother he would rather be a farmer. 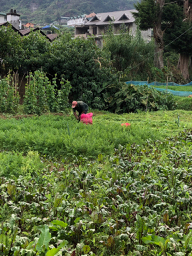 They grew everything, from carrots to eggplants, and lettuce to beans. There were so many fruit trees in the garden I lost count and delightfully, they had labelled them all. Then I met the executive chef, D.G. Arachige and he agreed to allow me into his kitchen to give me a cooking lesson in Sri Lankan fish curry making. 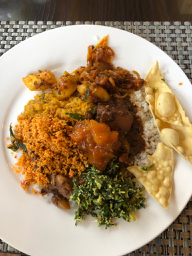 What makes Sri Lankan curries distinctive? Fresh curry leaves, fenugreek, fennel seeds and something sour – like tamarind. 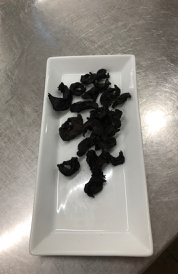 Our chef used this – GORAKA Garcinia zeylanca – a kind of sour dried peach – I regret giving this a nibble when offered – it tasted like the nail clippings from a very old camel. 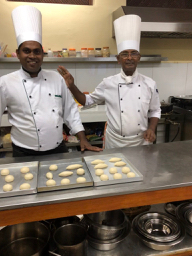 Chef D.G. – as he was known, with his apprentice and the fish and winged bean curries we cooked up with homemade mango chutney and coconut sambol. Everything was delicious, along with the split-pea dahl, which seemed to be served with every meal. It all goes down very well with a Sri Lankan Tiger beer. He also made ‘hoppers’ for me. A traditional Sri Lankan snack/breakfast dish. 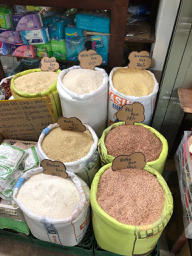 These are bowl shaped crispy pancakes, made from a batter of rice flour and coconut milk – you eat them with a fried egg in the middle liberally sprinkled with black pepper – they are crunchy yer pliant – delicious. A five hour journey by car from KANDY further up into the hills and forests, past picture postcard rice fields, colourful bustling market towns, and finally to the quilted landscape of Sri Lanka’s most important crop – TEA plantations and the hill town of NUWARA ELIYA, established by the British to escape the hot weather – it is the SIMLA of Sri Lanka. It still has the feel of the most English of colonial outposts with mock-Tudor type hotels, pink Victorian Post Office, polo club, golf course, British Cemetery and of course the Hill Club – where one can still take tea and scones in the afternoon listening to a tinkling grand piano. 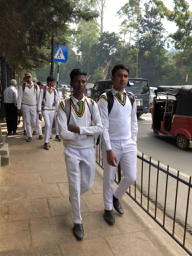 Wandering around you are also likely to spot school students, on their way home, decked out in a uniform that would not be out of place on an English county cricket field, and how handsome ?! 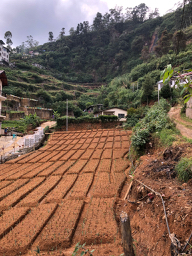 On the way to NUWARA ELIYA we visited the traditional BLUE FIELD tea factory surrounded by thousands of clipped tea bushes stretching away over the hillsides. 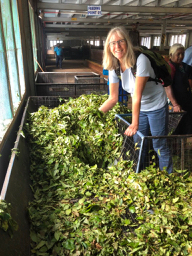 Tea is the dried leaf-bud of Camellia sinensis – from the common camellia family beloved by gardeners for their spectacular winter flowering displays. 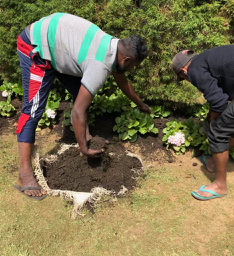 Most of the workers in these fields – doing the back-breaking of plucking the young leaves from dawn till dusk – are the dark, slight Tamil people – originally brought over by the British from India. The cavernous building of this plantation was more than 150 years old – and some of the machines were 100 years old. The most modern was a dross separator which worked on electrical friction and picked all the twigs and bits out of the drying leaves – and guess what they did with all the waste – you’ve got it – COMPOSTED IT ALL for use in the nursery. 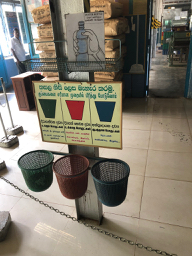 They also had recycling bins everywhere we went in Sri Lanka, including in this factory. 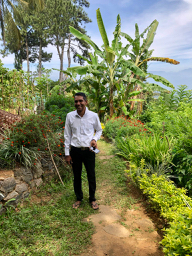 It was another 10 degrees cooler in NUWARA ELIYA which was great for going out walking and exploring. 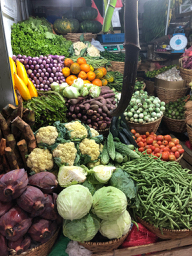 There really was food growing everywhere and a fabulous market in the town where everything was sold bare – from fish to grains to fruit and vegetables – a feast for the eyes and nose. No wonder the food tasted so good. No hydroponics here. Top tip. Go for a walk in the VICTORIA GARDENS in the centre of town. 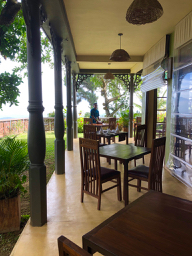 It’s a haven out of the traffic, has a great cafe with Sri Lankan buffet AND sells REAL COFFEE – something which is very hard to find in Sri Lanka – they do fabulous tea and terrible coffee. 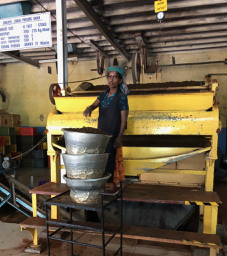 We had learned, by the end of the trip, to ask for kopi ceylon – which is what the locals drink and very similar to the muddy, black sweet coffee you get in Indonesia – which I personally love. They think tourists want Nescafe? 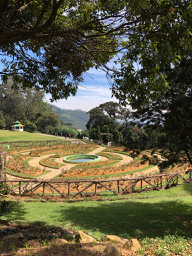 I put aside a whole day to visit the HAGKALA BOTANIC GARDENS 10km south of Nuwara Eliya and what a treat it was. I just wish that I could be there in April when I would see the glory of all the bedding plants that were being prepared by the gardeners – not only here, but throughout the whole town too. This flowering display attracts half a million visitors in April and May. We were here in January – the middle of summer back in Australia – but the just emerging buds on the creeping jasmine told me it must be early spring here – ideal for walking and sightseeing. It’s good idea to check the seasons – especially the monsoons – before you come – they differ from the west to the east. We went by tuk-tuk and the friendly driver agreed to wait for us while we wandered off into the gardens. It’s funny how, when we come from the rigidly controlled ‘first world’ of OH&S that we are prepared to throw caution to the wind, when we are away from home, and hop in the back of seat belt-less vehicle, with no doors, and hurtle along at break-neck speed mostly with one’s eye shut – well, mine are anyway – and trust in the skill of the driver to get you home safely? Just outside the Gardens is a very golden Hindu temple dedicated to SITA with this area forming an important historical part of the RAMAYANA story with Sita taking refuge in what is now – the Gardens I had read about this before when first encountering this epic tale played out in performances in Bali and Jogya (Indonesia), and I find it great when travel to a new place adds another piece to the puzzle of knowledge. Suddenly a bit more fell into place. This beautiful garden is dominated by a towering rock- its namesake – HAGKALA – meaning ‘elephants jaw’ with wonderful views down the valley and over the 28 hectare garden. 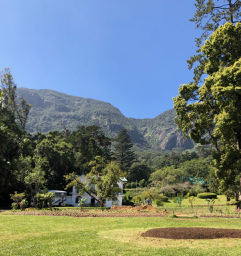 It was established by the British in the 1860’s and its original purpose was as an experimental garden for the plant CINCHONA – that QUININE comes from – they then planted the first tea plants – bringing them from Assam in India. 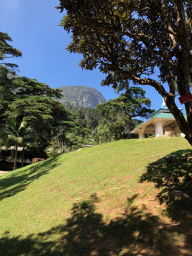 At over 1000m the air was beautifully clear and sparkling blue – not something you see every day in Sri Lanka. I got the fright of my life, on a quiet upward path, when a handful of monkeys (GREY LANGURS) started swinging through the trees above me – one with a baby clinging to its front – then dropping to the ground around me to graze on the undergrowth. They didn’t seem fazed by my presence at all and I watched them in fascination for some minutes. 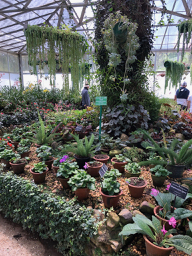 The Medicinal Gardens, fabulous towering 100 year old trees – with many species from Australia – and greenhouses are all worth a visit – AND I was most impressed to see the gardeners giving the soil a top-dressing with – drum-role COMPOST. So. The first part of our trip was over. 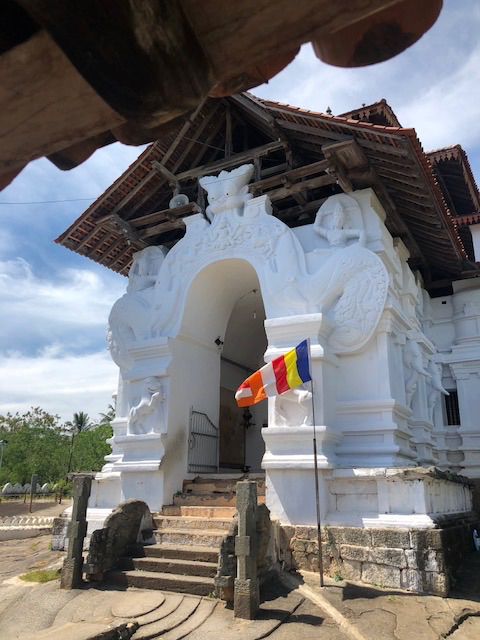 Next we headed to the coast for a complete contrast to visit MIRISSA, GALLE and BENTOTA. The best was yet to come – I kid you not. To be continued.